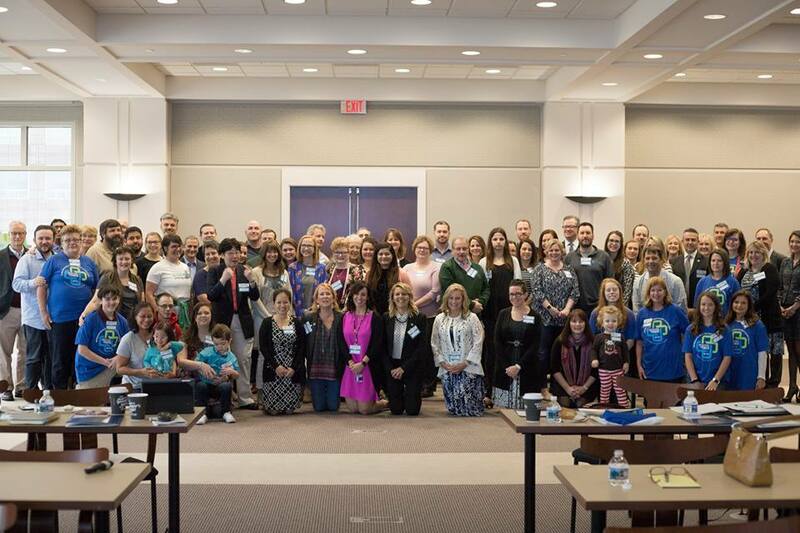 I had the honour of representing PTENUKI at the first international symposium held in Alabama in March 2018. As a parent of a PTEN patient as well as a founding member of our patient support group, it was a fantastic experience. I felt I learnt all there is to know about PTEN, met some top medical experts in the field as well as meeting some amazing patients and parents that are also affected by the PTEN gene mutation on a daily basis. It was great to suddenly not feel alone, realising there are people affected by this condition all around the globe and also top medical professionals that are researching the condition to help people like ourselves – the future suddenly looked brighter! The Symposium started with an informal meet and greet on the Sunday afternoon in the hotel. It was a great chance to meet doctors, researchers and other professionals that would be speaking the next day. It was also a great chance to chat to other patients and parents to swap life stories – when and how we were diagnosed, things that have gone great, and things that have not gone so well! Everyone was so welcoming and they were really interested to hear all about what we were doing here in the UK. They were thrilled to hear we had set up a patient support group and wanted to hear all about our plans for the future. The Monday started off bright and early and with lots of coffee! We were welcomed to the Symposium by Kristin Anthony, the president and founder of the PTEN Harmartoma Tumour Syndrome Foundation (https://ptenfoundation.org/) and a Cowdens Syndrome patient herself. Kristin started the Foundation in 2013 as there was a lack of knowledge, support and resources for patients with the condition. As a two time cancer survivor and member of the PHTS Foundation team, Kristin works to raise funds for PHTS research, to educate the public about PHTS and to bring awareness to the lack of research funding for this rare disease in America. The key note speech was made by Dr Charis Eng, a global leader in cancer genetics and cancer genomic medicine. Dr Eng was the first medical professional to link the PTEN gene to Cowdens Syndrome and to autism spectrum disorder. She is also the Medical Director of the PTEN/Cowden Multidisciplinary Clinic at the Cleveland Clinic in Ohio. Throughout the day it was great to hear all about the medical research happening over in America at this time. The studies have been conducted between the Cleveland Clinic, Boston University and Stanford University, with the hope that the three geographical locations will give the patients and participants choice and flexibility of where they can take part. Dr. Siddartha “Sid” Srivastava from Boston Children’s Hospital also went on to discuss the findings of the longitudinal PTEN study that has been taking place for the past 3 years. So far, they have concluded that more boys than girls have PTEN with ASD. They have also found there to be a decrease of IQ with age however this could be down to the fact that participants were still gaining skills, just at a lower rate than a non-PTEN patient (therefore their IQ appears as though it is decreasing) or their IQ was plateauing or they were even losing skills – this is still an unknown for now. They have also found that patients with PTEN and ASD have more white matter in their brain, whilst patients with PTEN but no ASD have less white matter and more grey matter. Dr Eng and her team are currently looking into this as they are still unsure why this is the case. We were then given a very interesting talk by Dr Thomas Frazier who has been a long standing member of the Cleveland Clinic team but now is the Chief Science Officer at Autism Speaks (https://www.autismspeaks.org/). Dr Frazier’s clinical interests include diagnostic evaluation as well as the use of intensive behavioural intervention to improve functional outcomes for individuals with autism. Dr Frazier’s research concludes that, in general, patients with PTEN ASD have higher emotional dysregulation which is the reason behind their less challenging behaviour. It is also the reason why they have more difficulty focusing on tasks and paying attention. Dr Frazier concludes that a PTEN patients’ lower IQ is the outcome of the combination of slower processing speed and the impairment of working memory and sustained attention. Dr Frazier emphasised that early intervention is best. He is a great advocate of ABA therapy, parental intervention and training and early referrals for OT, PT and SLT. He also believes that the use of slower and shorter communication strategies is highly beneficial to PTEN patients and repetition is key to memory retention. Another very beneficial part of the day was the presentations about three cancer risks for PTEN patients – Breast cancer, GI Cancer and Thyroid cancer. PTEN patients that get breast cancer are more at risk of getting another type of cancer, according to research carried out on PTEN patients so far. The current NCCN guidelines (which are updated every three months) recommend that a PTEN patient starts clinical breast exams, every 6–12 months, starting at age 25, and breast screening at the age of 25, or 5-10yrs before the age of anyone else in the family that has been affected. The risk of PTEN patients also being affected by GI cancers has decreased, thanks to colonoscopy screening. However, more than 90% of PTEN patients suffer with colon polyps. It is recommended that a patient starts screening at the age of 35, or 5-10yrs younger that the youngest family member affected by the cancer. It is also recommended that the colonoscopy is repeated every 5yrs. Colon cancer can be prevented if polyps are removed. For PTEN patients it is vital to look out for weight loss, rectal bleeding and a change in bowl habits. If you are worried about any of these, then a colonoscopy is advised. Thyroid cancer is more common in PTEN patients and has the earliest onset of all the cancers. The earliest known case in a PTEN patient is the age of 7yrs, however the average age of diagnosis is 35yrs. It is the second highest type of cancer in PTEN patients, second only to breast cancer. It has been found that more women than men suffer with this cancer. Medical experts recommend a baseline thyroid scan when the patient is diagnosed with a PTEN gene mutation. The typical symptoms to look out for are lack of energy, an intolerance to the cold, dry scaly skin, constipation, weight gain, muscle ache and brittle hair. The recommended treatment for such cancer is total removal of the gland and thyroid hormone replacement drugs along with long term surveillance. There was a great talk by Dr Karen Hurley, who discussed the psychological effects of cancer risks on PTEN patients. She discussed not only the time needed to process a cancer diagnosis but also the fact that a cancer patient is not told what to do – all decisions are yours, and scary ones at that. She discussed freely about imperfect choices and the acceptance and peace that comes later. There are three stages to a cancer diagnosis on a cognitive level, emotional level and then finally on an action level. If you or a family member are struggling with a cancer diagnosis then I would highly recommend watching her talk (https://www.youtube.com/watch?v=rg9ODO3HJao). It was highly informative, comforting and helpful. In conclusion, this symposium was a fantastic event. It was great to meet and speak to the top medical professionals in the PTEN world as well as meet and learn from other PTEN patients and their families. The next International Symposium will be held at the Cleveland Clinic, Ohio on the 6 – 9th April 2019. If you are interested in attending, please contact us and we will be in touch as soon as we have more details.